Angel, a 9-month-old spayed female Yorkshire Terrier, was referred for evaluation of anemia that developed the day after surgery to remove a metallic button from her stomach. A CBC, Chemistry profile, Spec cPL, and urinalysis were submitted to IDEXX for analysis. On the CBC, the sample was grossly hemolyzed, and there was severe, macrocytic, hypochromic, regenerative anemia with a hematocrit of 16.3% (reference interval, 37-55%) and reticulocyte count of 192 K/uL (reference interval, 10-110 K/uL). 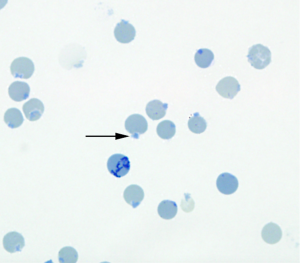 On review of the blood smear, moderate numbers of Heinz bodies and red blood cell ghosts were seen, indicating Heinz body hemolytic anemia (Figure 1).The presence of Heinz bodies was confirmed by staining with new methylene blue (see arrow, Figure 2). Blood smear showing moderate numbers of Heinz bodies and red blood cell ghosts were seen, indicating Heinz body hemolytic anemia. The presence of Heinz bodies was confirmed by staining with new methylene blue. 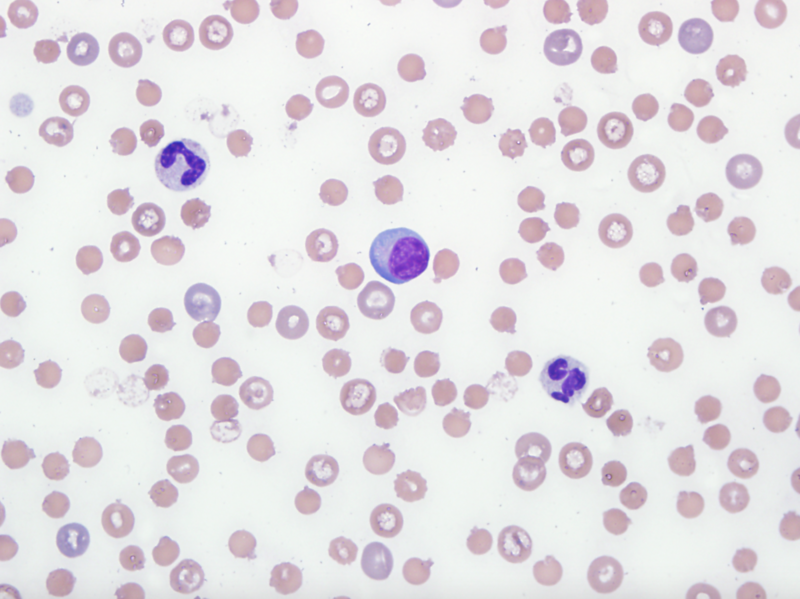 There was also mild leukocytosis with neutrophilia with a left shift and monocytosis consistent with an inflammatory leukogram. The neutrophils had slight toxic change and reactive lymphocytes were noted as part of the inflammatory response. The chemistry results included mild hyperbilirubinemia attributed to hemolysis. There was also increased amylase (7,370 U/L; reference interval, 450-1240), lipase (1,680 u/L; reference interval, 100-750), and the SPEC cPL was greater than 1000 ug/L, consistent with pancreatitis. Heinz body formation in red blood cells is due to oxidative damage, and results in severe hemolytic anemia in dogs. Multiple oxidants can cause hemolytic anemia. In this case, the metallic button was likely composed of zinc. Common household items that may contain zinc include pennies, batteries, nuts, bolts, board game pieces, costume jewelry, and mineral supplements. Zinc toxicity can cause severe Heinz body anemia, as well as pancreatitis and renal damage. Although the source of zinc had already been removed, zinc blood levels will remain increased for several days after removal of the foreign body, and the hematocrit may continue to decrease. Angel was hospitalized for monitoring of anemia and treatment for pancreatitis. She received a transfusion during hospitalization and made a full recovery.